With Christmas just around the corner, here&apos;s a look at classic Austin stores and businesses that can help get your shopping all wrapped up. Discover toys from your childhood and today at Toy Joy, an Austin mainstay with a selection that makes even a 34-year-old kid grin. Waterloo Records. Photo courtesy of Andy Mahr. 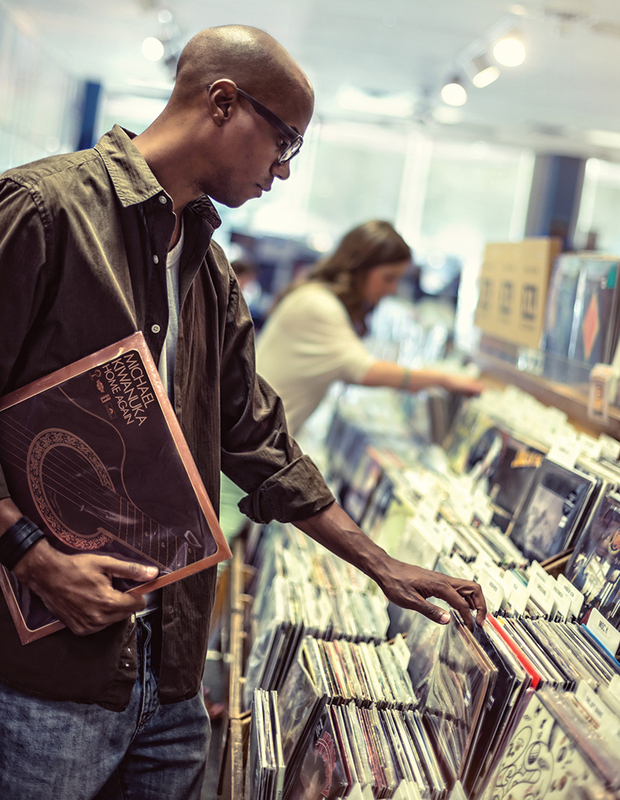 There&apos;s a reason Waterloo Records is voted the best record store in Austin by the Austin Chronicle&apos;s reader poll year after year - likely because the store caters to the music lover first and foremost. This is the place to score everything from a bright orange Crosley Cruiser turntable to the new Patty Griffin album on your sister&apos;s wish list. Helm Boots, a rustic-chic shop located on East Sixth Street, sells its own wide selection of American-made boots with the details and design aesthetic of high-end designers. Find crave-worthy totes and comfy socks too. Stop by our Austin Visitor Center for information on tours of the city, events, and more. And while you&apos;re there, browse around Austin&apos;s official gift shop. You&apos;ll find everything from Austin souvenirs to Tito&apos;s Handmade Vodka merch to our annual Austin Music CD. Put your friends in the holiday spirit with a bottle (or bottles) of Austin-made hooch. Want to know the trick to a mean margarita? Add Paula&apos;s Texas Orange for a mighty tasty marg. Dubbed America&apos;s original craft vodka, Tito&apos;s Handmade Vodka is produced in small batches right in Austin, at Texas&apos; oldest legal distillery. If you favor a brewski, sample what Independence Brewing Co. is tapping. From Bootlegger Brown to Austin Amber, Independence has spent the last decade satisfying local beer drinkers. Check out Austin Art Garage to find original art that won&apos;t leave you broke. This garage isn&apos;t full of dusty relics relegated to the darkness, instead you&apos;ll find beautiful artwork. Be sure to check out the dreamy paintings by Graham Franciose and stunning Austin landscape photos by Merrick Ales. For the barbecue connoisseur, turn to local barbecue mainstays for gift ideas. Stubb&apos;s Bar-B-Q sells seven varieties of its bar-b-q sauces and a slew of marinades, rubs, cooking sauces and "anytime" sauces, like the Texas Sriracha Anytime Sauce. Along with gift cards and sauces, The County Line ships its (frozen) smoked ribs, brisket or sausages by two-day air. And at Rudy&apos;s Country Store and Bar-B-Q Sause (not sauce), smoked barbecue meats, or even koozies, shirts, hats, aprons or teensy onesies are available. Need something for your beloved - albeit slightly quirky - college roommate? Turn to Parts & Labour. From Texas Jackrabbit tea towels to Pac-Man themed necklaces, this eclectic South Congress Avenue shop is sure to stock the perfect somethin&apos;. Fido will adore a gift from Lofty Dog, a locally owned and operated pet boutique that offers premium food and treats, unique toys and more for both cats and dogs. Score all the burnt orange attire you could ever want at the University Co-Op. From Longhorn game day attire ranging from T-shirts to jackets, sweatshirts and socks to gift items like stickers, magnets, decor and flags, the Co-Op is the place to find your Hook Em Horns garb.